*This giveaway is now closed. Winners announced in a separate post shortly. 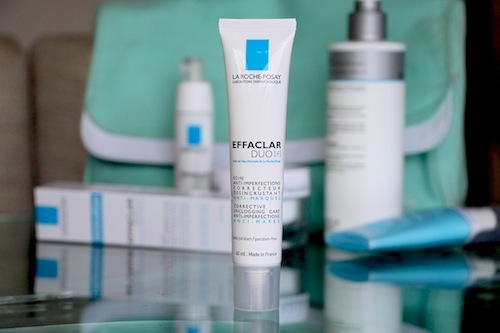 * As many readers will already know, Effaclar Duo is one of my staple spot-beating products. It seems to be one of the few products that works on those horrible, deep-seated pimples that lurk beneath the surface all red and hard and angry, as well as tackling run-of-the-mill blackheads and larger areas of congestion. I try to use it as soon as I sense trouble in the skin department – the first, achey sign of a red bump – and it definitely helps to quell the rebellion, so to speak. I like it because it doesn’t dry my skin out and it doesn’t burn – it feels quite gentle. It’s not a product I use daily, because my breakouts are very occasional, but it’s one that I wouldn’t like to do without. It has saved the day many a time – both as a precautionary measure and as a trouble-shooter – and I struggle to really find anything bad to say about it. It’s affordable, effective and is as suitable for temperamental teen skin as it is for people suffering from the odd adult acne outbreak. 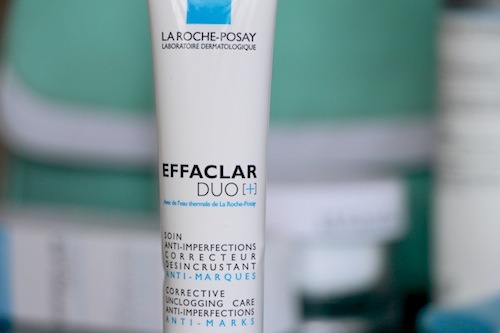 And now – what joys – La Roche-Posay have actually gone and improved the formula! 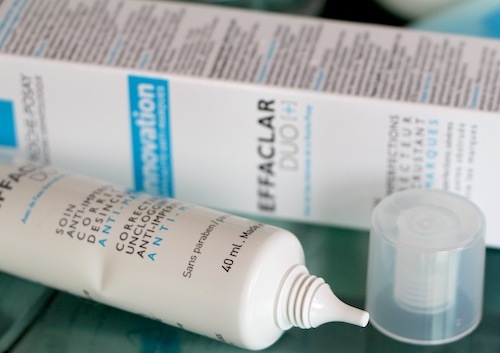 The new Effaclar Duo+ now helps to prevent those awful red marks or dark spots that hang about after the spot itself has cleared. Very often it’s the scarring or dark marks that actually cause the most upset – they can take months or even years to disappear and are actually more noticeable than the original blemish. The new Duo contains a new active ingredient that super-sizes the effects of the product, soothing the skin to diffuse inflammation and, as they word it in the press material, “accelerating the skin’s return to integrity”. An all-in-one spot solution, then, hopefully; helping to prevent spots, coming in with a bit of damage control if they do happen to appear and now acting as a clean-up squad to help stop dark spots forming. It’s as simple to use as before – just apply it to affected areas after cleansing. The new Duo can be used with or without moisturiser over the top – I have always found it to be moisturising enough on its own, and the improved formula is apparently even more suitable for all-over application, but as always it’s down to individual needs. I know that some people felt that Duo was too much for their skin used over larger areas, so feel free to test it on smaller, more targeted areas first if you don’t need to treat your whole face. Anyway, I shall be giving this a good old test when the next pustule-from-hell rears its ugly head, but for now: rejoice, for I have 100 tubes of this wonder product to give away. ONE HUNDRED TUBES! I know. It’s immense. The second thing that you need to do is leave a comment below. You can say anything you like, but don’t swear, and make sure that you leave a real email address in the form where prompted. Comments take a while to show up, if you’ve never commented before, so be patient and don’t keep trying over and over again – one entry per person! Please leave your comments before 12 noon on Monday 27th January – winners will be picked at random and their email passed onto La Roche-Posay who will sort out delivery. OK, people: go go go! Fly like the wind! Next Post Please Join Me for my Makeup Meet-Up!